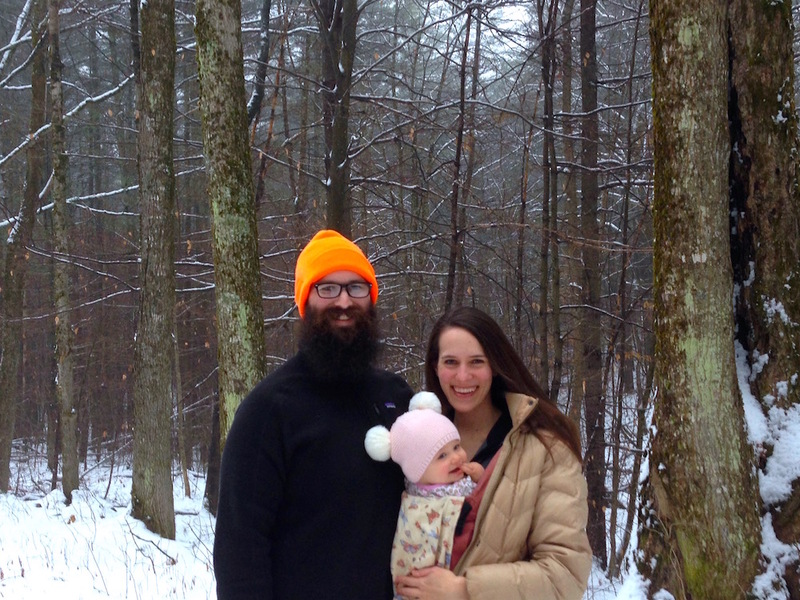 Here in Vermont we are finally and firmly entrenched in a lovely, snowy, cold winter season. Living out here on 66 acres in the middle of the woods, our lives are increasingly dictated by the seasonal shifts we experience. Given these weather-related imperatives, I try to appreciate and embrace each season’s nuanced joys. I want to wholeheartedly consume whatever’s on offer and not compare one season to the last. There are remarkable opportunities provided by nature every month of the year and I find it liberating to delight in each new weather pattern. Complaining about the cold or the heat misses the point of how unique and exciting it is to have such diversity in our lives. I’m grateful for how dramatically the landscape alters itself with folds of snow or piercing rains or unadulterated sunshine. And I’m thankful for the different ways in which I can interact with my ever-changing world. Yeah, yeah, yeah, sounds good, right?!? But what about when you’re trapped inside with a toddler on a subzero day? What do you do that’s exciting, stimulating, and cheap (or free!). Since we on Frugalwoods don’t take the easy way out of spending money to solve such wintertime conundrums, I’m dedicating this month’s Reader Suggestions to that very topic. Where does one find the sweet intersection of fun activities that are also free? My chief approach to wintertime recreation is to not fear the cold. Except in the most dire of circumstances–extreme windchill temperatures or active blizzards–there’s no reason not to get outside daily during the winter. We do! Playing outdoors is an instant mood recalibration tactic for kids and adults alike. Moving our bodies, breathing fresh air, and reveling in the presence of snow is, frankly, awesome! Our primary wintertime outdoor activities are hiking and snowshoeing. Both have a pretty low barrier to entry and are fairly inexpensive to do. 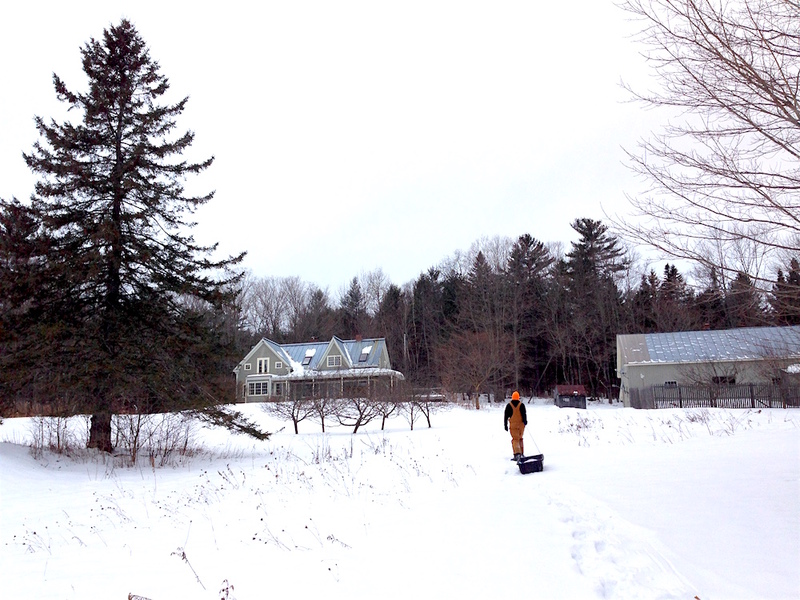 I like the ease of strapping on snowshoes and taking off into our woods. 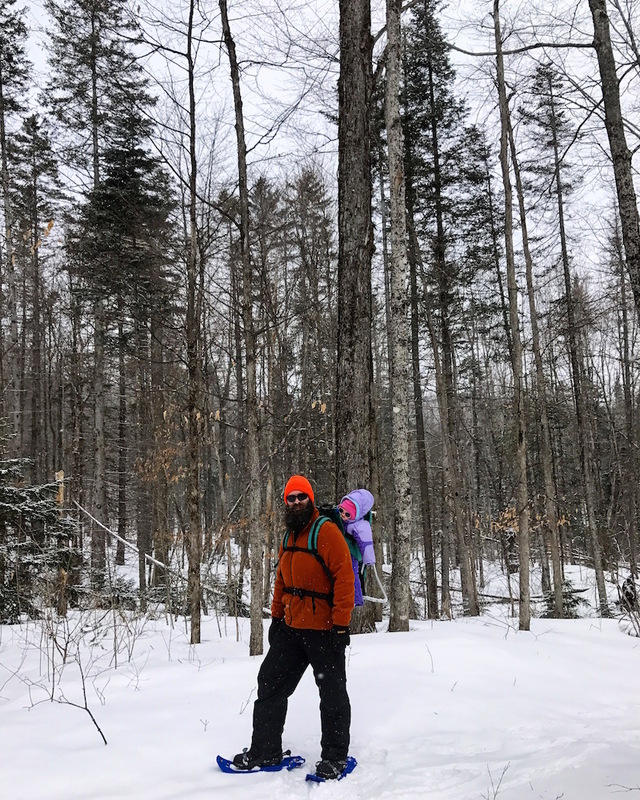 It doesn’t require a whole lot of skill or coordination (good for me… ) and the snowshoes themselves are relatively inexpensive (we have these). I’m trying to get Babywoods into building snowmen, but so far she just wants to eat the snow. It’s a work in progress. Too true! Don’t brush this off, I’m not kidding! I slowly began to outfit myself properly for the cold and, the first time Mr. Frugalwoods and I took a walk around the city in my new-to-me outdoor gear, I was in awe. I wasn’t cold. I wasn’t unhappy. My toes were not froze. And I am a small person who gets cold easily, so know that I don’t say these things lightly. Plus, I’m a native of southern California, so this is all learned behavior. I’m currently wearing two sweaters inside my own house–but I’m not cold! Long underwear: any non-cotton (silk, spandex, etc) shirt and pants will do. Socks: wool is best and cotton is your worst enemy. Do not wear cotton socks in the cold (I speak from personal frozen toe experience here). Hat: Mr. FW and I both have a windproof fleece hat, which works wonders. It comes down low across the forehead and ears and is impervious to even the most frosty of winter gusts. Do not try to knit your own hat. It will not be warm enough (ask me how I know this… ). Hand coverings: I don windproof mittens with a waterproof shell and a layer of thinsulate, while Mr. FW prefers these gloves with glove liners. Facemask: The ultimate capitulation to form over function, I ADORE my facemask. Not an exaggeration. It keeps my nose, cheeks and chin from becoming wind-chapped. Mr. FW prefers the organic version and grows a robust beard every winter. Coat: Down-filled is the way to go. I found my Land’s End down-filled coat in a trash pile by the side of the road several years ago. I washed it with down wash (to preserve its waterproofed-ness) and, three winters later, it’s still keeping me roasty toasty. While wool coats are warm, they’re not waterproof and you’ll end up a soggy mess (plus you’ll smell like wet sheep… ask me how I know this). Snowpants: Mr. FW has full suspender snowpants (because he’s just that cool) and I have pant snowpants (not sure what the technical term is there) and both work well. Boots: Perhaps the holy grail of all winter garb, you MUST have warm, insulated, waterproof boots. We have these and they were worth every penny. Don’t try to find snazzy colors or prints on boots–that’s a dead giveaway they won’t be warm enough (again, ask me how I know this… ). 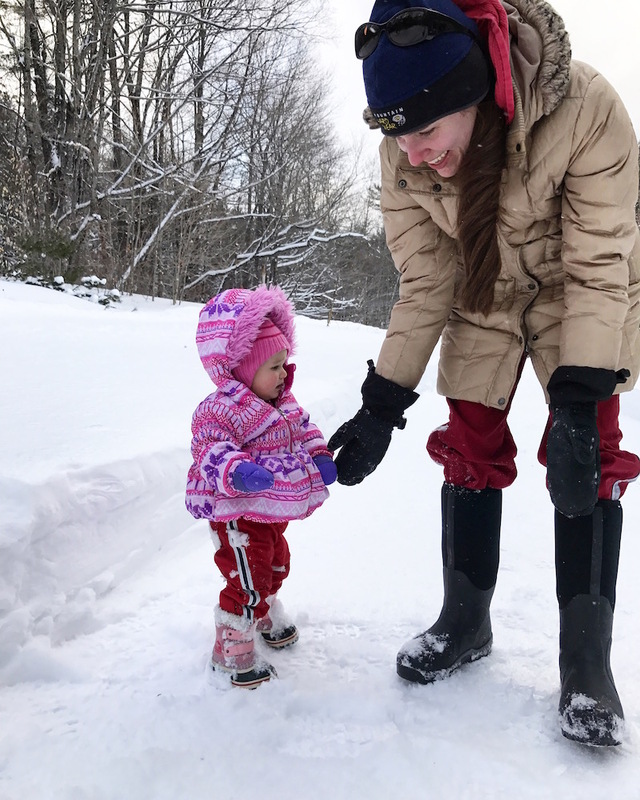 For Babywoods: hand-me-down snowpants, coats, wool socks, a fleece hat, and boots work great. I did, however, actually BUY NEW (can you even believe it??!!) these SnowStoppers mittens this year because they are the only mittens that will stay on. I tried all of our hand-me-down mitts first and they all miserably flopped right off. Hence, my splurge on something new! I felt doubly good about this purchase after her preschool teacher confirmed that these are the only brand that’ll stay on small paws. You put the mittens on BEFORE putting on the coat and then they don’t come off because the sleeve of the mitten is so darn long. I bought the age 2-5 size so that she can wear them for many years. In closing, remember that the “cuter” the clothes are, the less functional and warm they’ll be. Looking cute is nowhere near as important as staying warm. I promise you this. 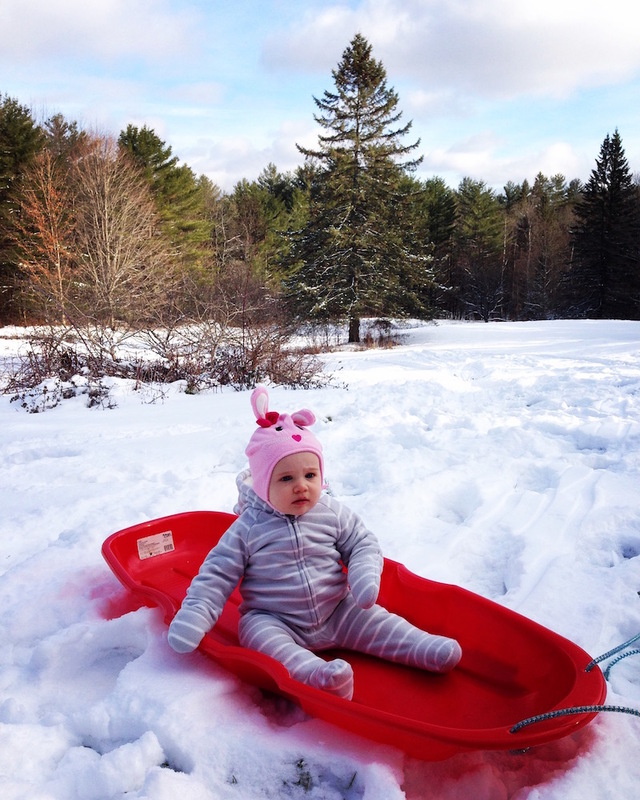 With the right snow gear, babies, toddlers, and kids can and will enjoy frolicking outdoors in the wintertime. And it’s good for them! Outdoor revelry promotes a healthy immune system, encourages exploration, builds confidence, provides exercise, and wears them out for great sleep. I can’t say enough about the benefits of taking kiddos out in the cold. 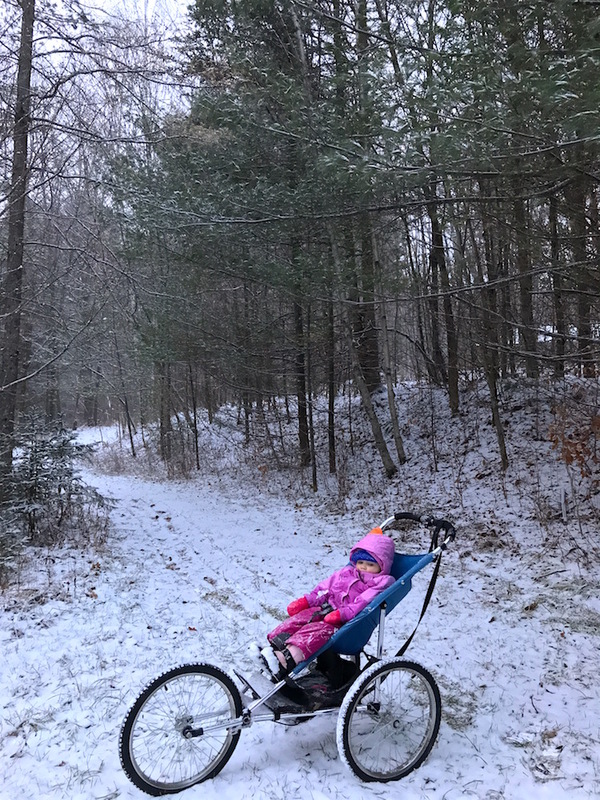 Scandinavian countries have long touted the health benefits of taking children (including babies) out in the cold and I am such a proponent of this mentality. It just makes sense. I love that Babywoods’ preschool takes the kids outside nearly every day of the year! 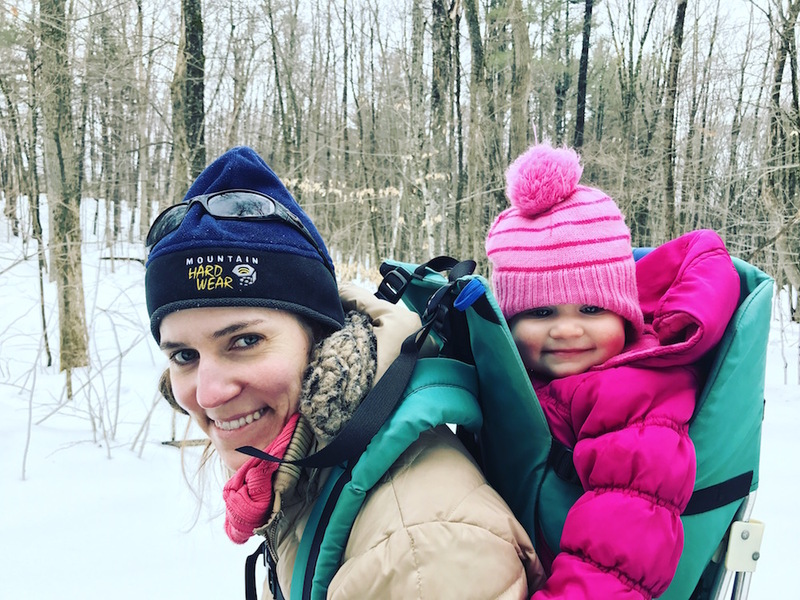 We started hiking with Babywoods when she was just a few months old and, seeing as she was born in late November, that was in the middle of winter. I snuggled her into a hand-me-down Ergo carrier on my chest and we were off. As she’s aged, we’ve adapted to several different modes of baby transit, including a jogging stroller with 20-inch wheels (purchased for $5 at a thrift store) as well as this large sled, which is actually a sled created for hunters to cart–ahem–expired animals out of the woods… works great as a toddler sled and was a lot cheaper than kids’ sleds and much, much more durable. 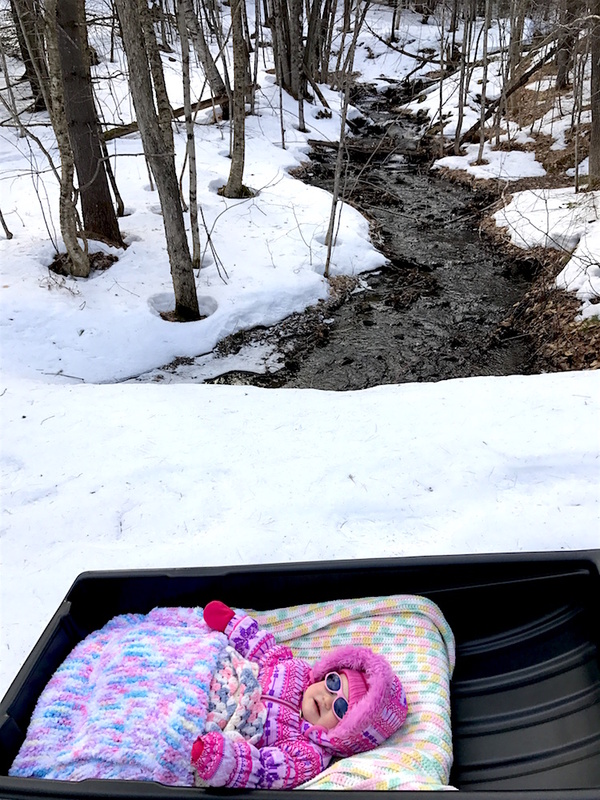 A standard little plastic kids’ sled isn’t strong enough for serious snowshoe hikes and the special ‘hiking baby sleds’ are, like, ridiculously expensive. Hence, our game sled is ideal: it’s rugged, has high sides to prevent snow from coming in, and is large enough to snuggle in at least two kids plus blankets. 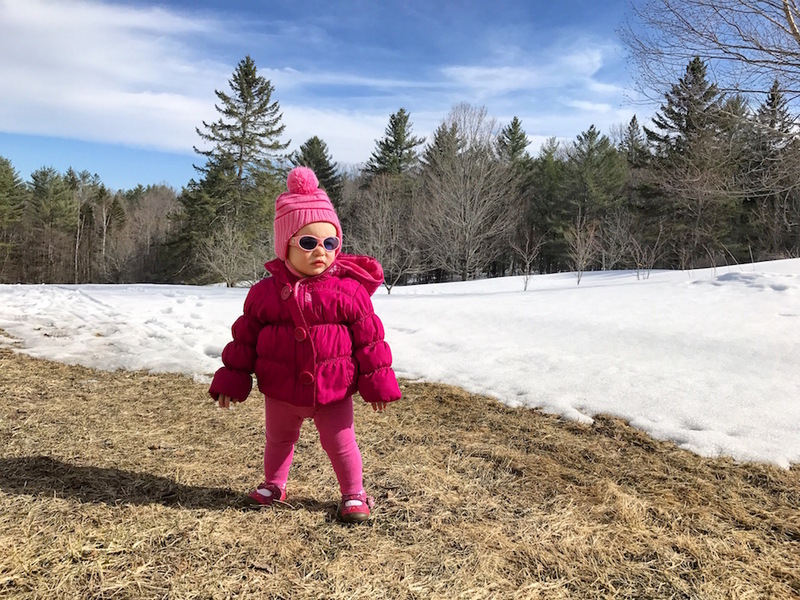 We obviously don’t spend every minute outside and, as toddlers are in need of activity, I’ve mapped out a weekly schedule of activities and events that enable Babywoods to interact with other kiddos and that provide her with a change of scenery. If you too have a toddler or baby, my top recommendation is to find the free playgroups in your area. They exist, trust me. I went to free playgroups when we lived in the city and I go to them now that I live in the actual middle of nowhere. Check your local public library, elementary school, hospital, nonprofits, organizations dedicated to family and child development–google around until you find them. Plus, you can host your own playgroups! Mr. FW and I hosted our first ever “baby potluck brunch extravaganza” last Saturday and it was a riotous success. Parents chatted and drank coffee while our kids ran wild, flinging blueberry muffins all over the place. It was wonderful. Word to the wise: don’t bother vacuuming before hosting one of these things. Save that for afterwards. 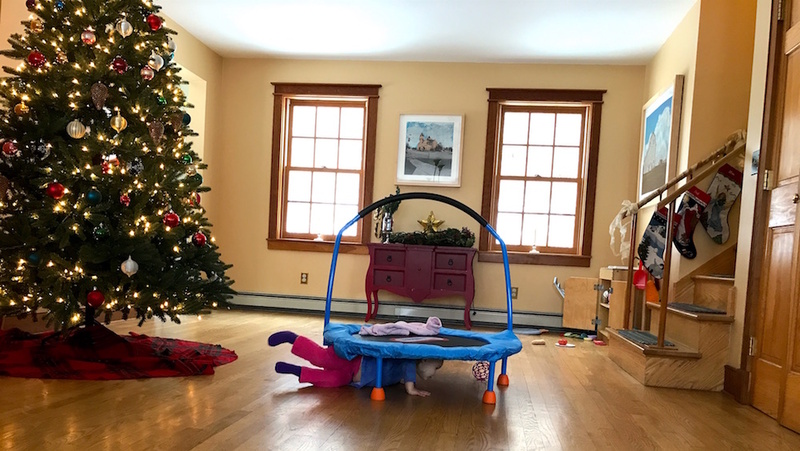 In terms of the time we spend at home alone, I find that Babywoods doesn’t require a ton of different toys, just a few good, age-appropriate items that encourage creative, do-it-yourself, imaginative play. Very popular toys in our home right now: this small trampoline (confines the desire to jump to one bouncy area! ), a play kitchen, books, dress-ups, a doll, and play-doh. Hours of entertainment. No need for fancy electronics or toys that sing songs. A kid will spend a great deal more time innovating with a scarf and an empty cardboard box (Babywoods calls it her “nest”) than with a fancy gadget that drains all the creativity and imagination from their play. Let kids innovate with household objects, don’t rob them of their innate desire to create and explore. I personally cannot believe how much mileage my child is getting out of an empty cardboard box that I accidentally left on the floor last week. It is incredible to see how many different games she has devised with this thing. I mean, it’s an empty cardboard box! But to her, it’s a portal to other worlds. The power of a child’s unbridled imagination indeed. Almost all of our baby stuff is second-hand and if you’re wondering how I source it all, check out: How To Find Anything and Everything Used: A Compendium Of Frugal Treasure Hunting. Enough from me! 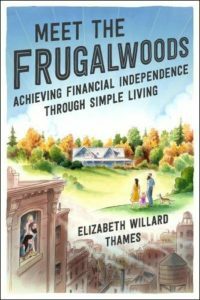 You came here to hear from the real experts–the readers of Frugalwoods–and they did not disappoint with their advice this month. Per usual, I received too many fabulous responses from readers to include all of them below, but you can check out the full conversation on our Frugalwoods Facebook page. And if you’d like to weigh in on next month’s topic, you can join the Frugalwoods Facebook page. The wonderful thing about these suggestions is that not all of you live in places where it’s cold during the winter (or ever), so this is a fabulous amalgamation of frugal activities to partake of no matter your climate or geography! Sarah relayed, “For inside we make hot chocolate, pop popcorn, and read books. Outside, we (read: my husband), tries to build snow caves, and we just play around in the snow. Then we come in and drink more hot chocolate… My husband loves to ski, which is an expensive hobby, but he’s found ways to volunteer at ski resorts that gets him free day passes.” FRUGAL PEOPLE: did you see the part about volunteering in exchange for free ski passes??? I keep telling you these things are possible! Check out our Reader Suggestions Barter and Trade post for more on this brilliant idea. Melissa shared, “I’m a knitter so I love winter. 😊 some herbal tea and a documentary and my knitting and I’m happy for hours. I also run outside year round so I do bundle up and head out in the snow and cold thanks to some Yak Traks and lots of layers!! The winter–whether cold or warm–is no excuse to not enjoy yourself to the fullest. Embrace the season, get the right gear, and get going. One of the things I love most about my holistic frugal lifestyle is the creativity that’s inherent to everything I do. Whether it’s innovating a cheap sled solution for my daughter, or intentionally baking a lot of stuff to warm up the house on a super cold day, or finding every single free playgroup within a 20-mile radius of my house (oh yes, I have a list of them all), frugality encourages me to innovate and create. And what I love so much about the Reader Suggestions are the incredibly thoughtful and unique ways in which all of you fine people do the same thing! It’s easy to pay money to solve a problem or to entertain ourselves, but I’d argue it’s far more fulfilling and far more interesting to brainstorm inexpensive and free ways to create your own entertainment and devise your own systems for enjoying life. Thank you all for sharing such wonderful ideas today! What are your favorite wintertime frugal activities? Love your suggestions about having the right clothing. My parents bought me a “baby goat birthing kit” for Christmas a couple of years ago. It included a good barn coat and gloves. I have never been warmer! I totally understood just what you meant about being stunned at the difference when you wear good quality clothes. I shop for solid name brand boots for my kids from eBay, and now they stay out in the snow playing longer than ever. Our school district won’t let kids go outside once it’s 30 degrees. I understand that this is probably because not all kids are dressed for the weather, but it would be nice if one teacher took kids who are dressed right outside for a good run. They need it! Our school district lets the kids go out as long as its warmer then -20 F! But they make all kids wear bibs/coat/boots/hat/gloves. And have extras. So many great tips in here. The flashlight walks sounds scary but at the same time daring, and exciting. Might give it a try once Baby99to1percent is a little bit older. But now that she’s almost 1.5 yr old, we are really going to enjoy the holidays, last year she was just a tiny little baby. This year, we have a week long road trip planned to visit family members. 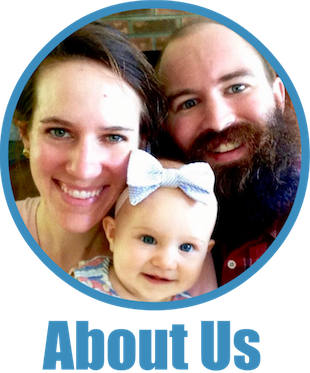 We look forward to seeing her interact with her cousins, uncles, aunts, and grandparents. The cookie exchange is a great idea! I love all things winter, and quite possibly one of those odd people that look forward to the peaceful dark nights and snow. Thank you Mrs. FW for a great post and sharing great ideas! I love all things winter too, so you’re not alone :)! These are great suggestions! It snowed in DC for 2 days the other day, and the snow quickly melted away. According to the weather forecast, it won’t snow until Dec 29, so we will have a snowless Christmas. I’m not sure how I feel about that, but I’ve been secretly hoping for a snowy Christmas. If there’s a full moon and snow on the ground you can easily go for a hike/ski in the woods without a flashlight! Those are some of the best treks I can remember making through the years. Also, because I’m a bit odd (ask my wife, lol! ), once the temp is below zero Fahrenheit (colder the better) you will always find me trekking through the woods. If you’ve never done it you’re really missing out. It’s a completely different experience and it increases the colder it gets. So quiet. The trails are always empty too! I absolutely love how quiet the woods are in winter! I went to college in Michigan’s Upper Peninsula, so winter started in November and didn’t end until April. Getting outside and on the trails was key to enjoying college, staying healthy, and not going stir crazy! Wow, Mandy! You have almost convinced me to move back to CA!!! Wow, Mandy! You have almost convinced me to move back to CA!!! Love your suggestions! Animal tracking is a blast for kids (and adults), probably starting around age 4, when there’s snow on the ground. Kids are so observant and it makes you start noticing everything around you. Start with people tracks, then try and figure out what your pets were up to, and then move along to wild animals that pass through your yard. Even birds. Learning about animal poop adds an element of huge interest for kids. There are plenty of great kids books on tracking at the library. My son and his friends loved tracking expeditions when they were little, and still do, even as teenagers. We live in the woods in New Hampshire so we can track right from our door. Downhill skiing is definitely a splurge, but it's one of our favorite activities. We always pack our own lunches and snacks to avoid $20+ mediocre ski lodge cafeteria meals. Plus, the husband has figured out how to tune our skis at home and we no longer need to take them to a ski shop for maintenance. Wonderful. I love winter, everything about it. I will soon be up near your neck of the woods in the Adirondacks for some ice-climbing. I realize that you cannot recommend such a risky and (on the face of it) kind of crazy activity for winter fun, but believe me it’s awesome! Bundled to perfection, we do a lot of downhill skiing (discounted passes and equipment), snowshoeing, winter running, hiking and sledding. Our son is now old enough to join us with some of these, but we had him in tow last year when he couldn’t walk as well on his own through the snow. I gave my kids (5&7) spray bottles filled with water and a little bit of food colouring and they were out spraying the snow for an hour! Also TOBOGGANING is fun for kids and adults and free! You didn’t mention blocks as part of your standard toys, and I’m a great believer in blocks – so I’m going to get on my soapbox:: Just plain old wooden blocks. We eventually, after learning the hard way, splurged on Childcraft blocks (which don’t look like they are still truly in business – try http://cpunitblocks.com/blocks.php instead).. The most important things are that they are of a good natural, uncoated hardwood, and that they follow the unit principle. Good point! We do, in fact, have a box of wooden blocks that are very popular right now as well :). Where did you find weather appropriate mittens/gloves for Babywood’s hands and how do you get her to leave them on? We have had to cut short our outdoor excursions this year because our little guy (who is almost 2) won’t leave his mittens on! We don’t have as much of a problem getting him to leave his hat or coat on, but I think he feels the mittens are too cumbersome. They interfere with his abilities to pick things up. And the fall off. Not a good combination. Great question! I actually BOUGHT NEW (can you even believe it???) these SnowStoppers mittens for Babywoods this year and they do not fall off. Her preschool teacher confirmed that they are the only mittens that will stay on small paws. Being frugal, I bought the age 2-5 size so that she can wear them for years and they work great. You put them on before you put the coat on and then they do not come off because the sleeve of the mitten is so darn long. Every other kind of mitten flops right off (I tried all the hand-me-downs we had before splurging on these). Good luck :)! Thanks! These look great. We buy most clothes new (on sale) because there is such a large problem with smoking in our area. It’s too hard to get the cigarette smell (much less the unscented chemicals) out of clothes. We purchased the mittens for our little guy (he’s in the bottom 10% in size, so I’m sure they’ll last a couple of years). They work great! We can spend an hour outside with them without worrying about them coming off. We couldn’t last five minutes with our previous mittens. Thank you for the recommendation. So glad they are working for you :)! Mom is 90 something and must use a wheelchair for most activities. In the snowy north this means she is stuck at home too much. To offset cabin fever we take her on “car picnics” which are just country rides with a thermos of home brewed coffee and peanut butter sandwiches. These are mood lifters for us all! Baby woods is soooo adorable. That photo of her in the sledge with a froth of pastel blankets is priceless. I get my best sewing and crochet done in winter. Plus we always have a 1000 piece puzzle on the coffee table. We lay the unfit pieces on a 24 inch square heavy cardboard piece. The actual puzzle gets assembled on the large coffee table. But if we have company, we have a piece of rubber carpet underlayment we roll over the puzzle and then cover that with a snazzy cloth. We carry the extra pieces on cardboard into another room out of harms way. I also highly recommend either American or Chinese mah jong. I learned at the local parks and rec and have been playing with neighbors once a week. I’ve knit plenty of wool hats that are warm enough for cold climates. Many factors go into making sure it’s roasty toasty, but it can be done. A cookie exchange?!!? Oh my yes that’s brilliant! Ha! It reminds me a lot of hygge movement (gosh I hope that’s how you say it). I’m not a fan of the cold but I certainly don’t mind it because it makes snuggling up so much better. Snuggling is a frugal past time 🙂 that’s what we do. Except now, I’m incorporating cookies thanks to Rachel haha. Our winter recreation is virtually free only because we continue to use snow gear that we bought years ago – backcountry skis, cross country skis. Nearly all of my wearable snow gear is thrifted. Heck you can even skin up the local ski resort for free and ski down it for free in your backcountry gear. Some places we ski are so close they are near our house cutting down on driving. However, I won’t be skiing this winter (had ACL reconstruction 10 months ago), not even walking in the snow still, so the “inside” winter tips here are great. I’ll add that we play instruments together (guitar and mandolin) too. Instruments were used and borrowed. Years ago, a rather ‘proper’ East coast elderly teacher told me…..children today have far too many toys. She advocated giving a child, from a young age, one toy a day….after washing and breakfast…..it took three days tops, for the baby to adjust to this, and the delight in something new each day was exhilerating. I was most impressed. I have to agree with Mandy that a properly knitted wool hat is plenty warm enough for icy cold weather and often blocks the wind better than fleece. The secret is to do stranded knitting or make double layers and to use wool, not acrylic. Also, contrary to what you say above, a down jacket will not keep you warm once it is wet through, and it will wet through quickly in the rain (though I love my down jacket for snowy days). Down is a real hypothermia danger in cold, wet conditions. Wool, when soaked through, will be unbearably stinky as you said, but it retains 80% of its warming ability. If you plan to be outdoors every day year round, keep your eyes open for a wool (not wool blend) jacket to wear in cold, wet conditions. Until then, wear a wool sweater under your down jacket when it is wet out. One fun thing we used to do in the winter was an indoor picnic. I’d spread a blanket on the living room floor and we’d enjoy picnic food for supper. Our child loved it. Mr. E. loves cross country skiing (not the expensive kind that requires a resort). We have been working on sourcing used skiis and boots either online or from friends and family ever since we got back to Norway this summer. I think he has a small hope that his parents might have picked up on it and that there might be some hand me down shoes from his little brother, who now has bigger feet than Mr. E. (yay for small feet, everyone else grows out of stuff and you can inherit it!). 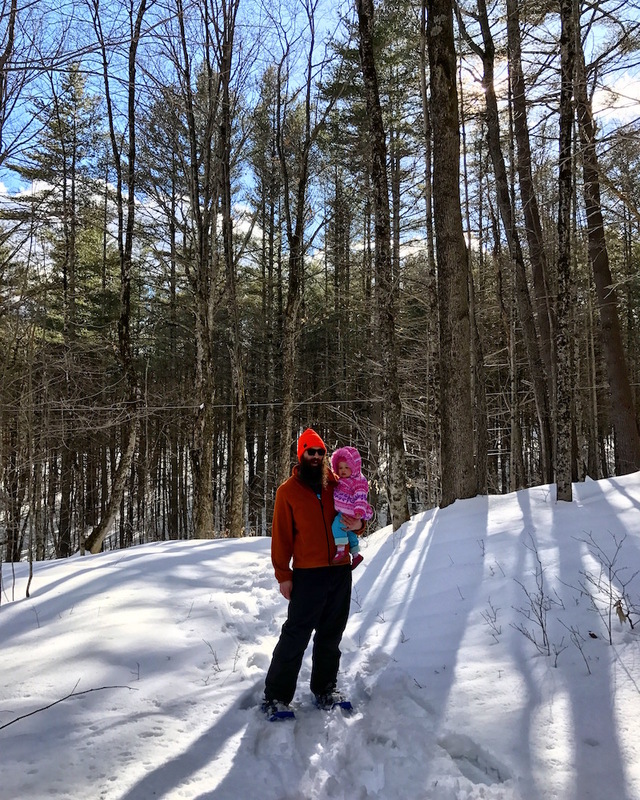 As a fellow Native Southern Californian/Now Central Vermonter, I agree whole-heartedly about the idea that suitable gear is the key to loving winter. My only gripe is the cost of getting outfitted. My kids are a little older (8,6,4), but Thing we do spend money on is fairly inexpensive swim lessons during the winter. The two older kids get lessons and the youngest and I just play in the pool. A few hours in the steamy pool is a nice change of pace from the cold and ice—and it’s helped them keep/develop their swimming skills between summers. We enjoy flashlight walks as well. We live in the desert in southern Idaho and have lots of deer and elk around our home. It’s always a treat to see them on our evening walk. Our walks also provide an opportunity to visit with our neighbors. It’s a great way to build our community and strengthen bonds with those we live near. 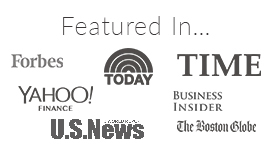 I’m a native Newport, Rhode Islander + love reading your posts. BTW , I will be 68 yo + we were hippies in the 60s + 70s. Many of our ideals were formed at that time, and your articles remind me of all those wonderful values/standards. We are now both retired + though Vermont is much colder in the wintertime than in our ocean state, we do get some cold weather. Our favorite frugal things to do in the Wintertime is make something in the slow cooker in the morning, which usually lasts for 3-4 days, and have it at suppertime; walk; and read . In the summer, we go to our favorite: Sachuest Beach, always with a picnic lunch, walk the entire beach, swim and have fun. In the Spring, it’s time to ready the outdoors for the flowers and get the yard ready. We have a little wildlife patch in the back of our home, and have learned frugality from a young age. Godspeed on your writings–I will be looking forward to more in the future days and years to come ! I explored with my children and am now exploring with my grand children the birds of our state and area. My grandchildren have a well known guide to bird identification and are using it to identify various birds they are seeing here in South Central TX. Can you share what kinds of boots BW has? Looking for a sturdy brand for my toddler! You guys must have so much fun in the snow! We live in Texas now, so my kids miss having a real winter. I live in sunny Queensland Australia and am currently experiencing the opposite weather, it is around 30 C with fans running and most people with cooling air conditioning running. I have never lived in snow, but have experienced snow whilst holidaying. I always say I prefer the heat to the cold, but it is often what one is used too. I couldn’t imagining wearing or even owning the clothing you talk about. I’ve found it’s key to find something you can only do in the winter to stave off the winter blues. So you can say, “It’s December, that means now’s my chance to do etc…” That way those dark months bring something to look forward to. For me, it’s snowshoeing in the local state park. I’m about to head out on my lunchtime walk, even though it’s 0 degrees out. That means no one else will be out and I’ll have the place to myself! I’d never heard of Hike It Baby but it sounds awesome! Thanks for sharing that, Faith. I’ll definitely want to sign up once baby and I are ready to get out of the house (pregnancy has me too exhausted to do much hiking right now). We bought those same mittens for our boys, the 5 year old loves them, they aren’t too bulky so he can still grab ski poles ets. The 2 year old fights them, doesn’t like the long sleave, wears other hand me downs that i dont think are as warm, but at least he keeps them on, and the 11 year old doesn’t like them with his coat, but I wear them instead. When my kids were small they loved to bake with me on cold winter days. We also played card or board games to keep them occupied. When I look back on how I played as a child versus today’s kids, I feel they are missing out on some of the fun and fellowship because they have their noses glued to video games. First off, I love that you found your coat on the side of the road. 10,000 frugal points to you! And secondly, Del Taco — your taco game is so on point. Can you come to the MidWest? I may force my husband into a sock fight (by the way awesome idea!) And to make the most amazing mulled wine, I add blackberry brandy. Warms you up from the inside out! My favorite tip for keeping warm during the winter? Keep moving! It’s way too easy to fall into a pattern of finding a comfy chair and covering up with a blanket. Instead, bust out a dozen push-ups! You’ll be toasty warm in no time! Snowshoeing is one of my favorite winter activities! the extra effort of walking through the snow makes a normal walk feel like more of a workout. Plus, once you acquire snowshoes its a frugal activity. Running is another surprisingly great year round activity – staying in good running shape over the winter makes spring running even better! When you don’t want to enjoy the outdoors, winter is a great time to catch up on reading. I love wrapping up in a blanket with a good old fashioned library book.